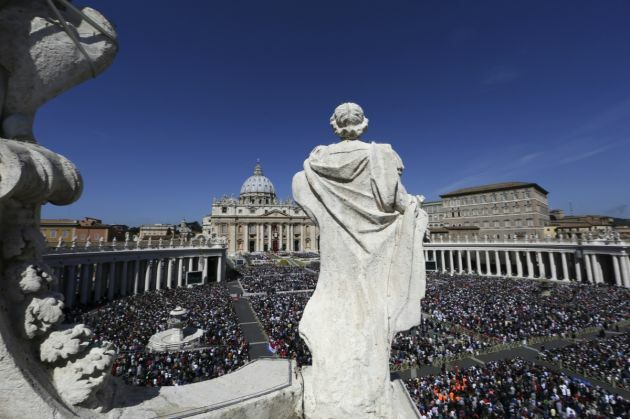 (Photo: REUTERS / Alessandro Bianchi)Faithful attend the Easter mass led by Pope Francis in Saint Peter's Square at the Vatican April 20, 2014. Below is a Vatican Radio translation of the Pope's message, which pleads for peace in the most distressing places in our world today. Dear Brothers and Sisters, Happy and Holy Easter! The Church throughout the world echoes the angel's message to the women: "Do not be afraid! I know that you are looking for Jesus who was crucified. He is not here; for he has been raised... Come, see the place where he lay" (Mt 28:5-6). "Do not be afraid! The Lord is Risen! Glorious Jesus, we ask you to comfort the victims of fratricidal acts of violence in Iraq and to sustain the hopes raised by the resumption of negotiations between Israelis and Palestinians. Lord, we pray to you for all the peoples of the earth: you who have conquered death, grant us your life, grant us your peace! Christus surrexit, venite et videte!